Organizations using a Microsoft Exchange Server to handle their emails may wonder why it would be necessary to implement an Exchange 2013 spam filter. After all, one would imagine that the world´s largest software company will have considered a mechanism to filter out spam emails in the server´s design. Well, it did. However, because of the way in which Exchange Server filter works works, some spam email always gets through. Microsoft Outlook´s Benoît Roumagère put that figure at 2% to 3% in 2013; and, as spammer´s methods of delivery become more sophisticated, it is likely that the percentage of spam emails not caught by Microsoft´s filters has increased. A further reason for implementing an Exchange 2013 spam filter is to increase protection against malware. Microsoft´s anti-virus products for business frequently receive poor reviews for their performance. With an Exchange 2013 spam filter, the level of protection against malware, ransomware and other viruses is much higher. An Exchange 2013 spam filter works by checking each email against a series of security mechanisms to identify spam. These include Global Blackhole Lists, Sender Policy Frameworks and Recipient Verification settings. Global Blackhole Lists are updated in real time and included in the filter´s front line tests to prevent a backlog of emails from accruing. When a spam email is identified, it is usually quarantined and reported to the end-user or system administrator. The end-user or system administrator has the options of delivering the email or deleting it. The same process occurs when an email potentially containing malware in its content or as an attachment is identified by the filter´s anti-virus engine. One other function of an Exchange 2013 spam filter is the scanning of outbound emails for spam and malware. This function does not exist on Microsoft´s Exchange Server, but it is an important one, as outbound email scanning prevents emails being sent out that might result in an organization´s IP address being included in Global Blackhole Lists. Microsoft offers businesses a premium spam filtering service – Exchange Online Protection (or “EOP”) – but the service lacks certain functions that are present by default in an Exchange 2013 spam filter. EOP has also been criticized for having a high maintenance overhead, failing to offer an on-premise option, and for being 20% to 25% more expensive than alternative spam filtering solutions. Some of the functions absent from EOP include “sandboxing” – in which email attachments suspected of being infected are isolated so that they can scanned at a later date – real-time dynamic link following, and “greylisting” – a security mechanism that asks a sender´s email server to resend an email suspected of being spam. Spammer´s servers rarely reply to the request. Can the advertised rate of spam detection be verified? How are emails identified as spam handled? What percentage of false positives does the spam filter return? What anti-virus software is used to identify email threats? What hosting options exist for the Exchange 2013 spam filter? Does an email continuity service exist in the event of downtime? Other factors will need to be considered depending on an organization´s individual circumstances. Smaller organizations with limited IT resources may have concerns about the maintenance overhead, while larger organizations may want their Exchange 2013 spam filter to include APIs to integrate the solution with third party management software. Managed Service Providers (MSPs) with clients using Microsoft Exchange 2013 will be particularly interested in the hosting options, the email continuity service and whether or not the Exchange 2013 spam filter supports multi-tenanting. If so, the MSP should enquire whether administration and reporting is “per domain”. Outbound scanning will also be a consideration if the MSP´s clients share an IP address, as will a flexible pricing model to address increases and decreases in demand. Also on the list of things to consider when conducting an Exchange 2013 spam filter comparison is whether or not the filter is available as a white label product for rebranding. SpamTitan Gateway is a virtual appliance that is easily installed between your firewall and your Microsoft Exchange Server. It is a powerful Exchange 2013 spam filter that equips system administrators with extensive tools to control the flow of email, and protect against unwanted email and malware. SpamTitan Cloud is a cloud-based Exchange 2013 spam filter that is quick to implement with a small change to your mail exchanger (MX) record. With virtually no maintenance overhead and a choice of three hosting options, SpamTitan Cloud is one of the most versatile spam filtering solutions available. Both spam filtering solutions block 99.97% of spam email and return a low false positive percentage of 0.03% according to the leading independent testing and certification body VB Bulletin. System administrators have the choice of tagging spam emails, quarantining them, or automatically deleting them – with recovery options also available in the rare case of a false positive. SpamTitan Gateway and SpamTitan Cloud both have dual anti-virus protection driven by the top-rated Bitdefender and Clam AV, while our email continuity service ensures the flow of communications during downtime or a server outage. Outbound scanning, sandboxing, real-time dynamic link following, and greylisting are included by default in our spam filtering solutions. Although we are happy to provide independent testimonials, we believe that the best way to evaluate the benefits of an Exchange 2013 spam filter is to try one of our spam filtering solutions in your own environment. In this respect, we invite you to try SpamTitan Gateway or SpamTitan Cloud free for thirty days – depending on which is the most suitable solution for your organization´s individual circumstances. To take advantage of this invitation, simply call our team of sales engineers today. 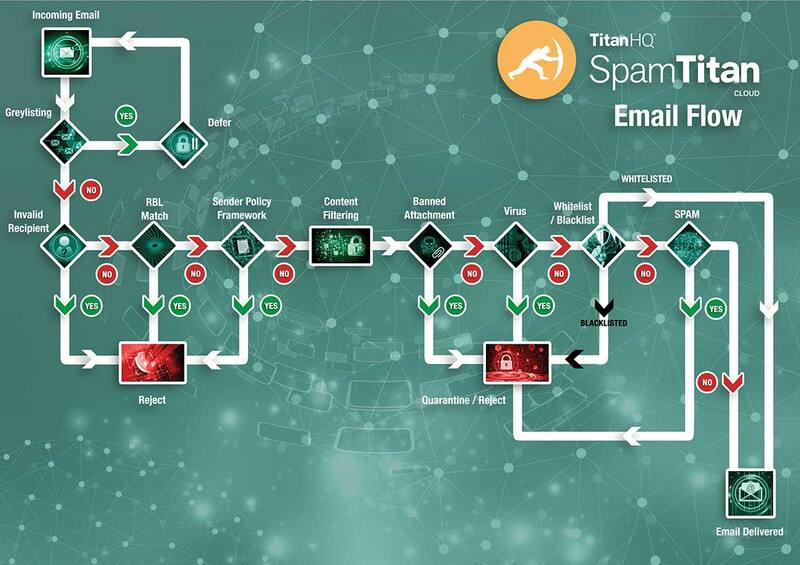 One of our friendly and experienced engineers will answer any questions you may have about an Exchange 2016 spam filter and guide you through the installation and configuration process for the most suitable of SpamTitan´s email filtering solutions. Our offer includes thirty days free access to a fully-enabled service, with comprehensive customer and technical support. We do not ask for any commitment to continue with our service once your trial period is over; but, if you agree that SpamTitan´s Exchange 2013 spam filter prevents spam emails that Microsoft is unable to catch and increases your protection against malware, we have a range of pricing plans available to suit every size of organization and every budget.